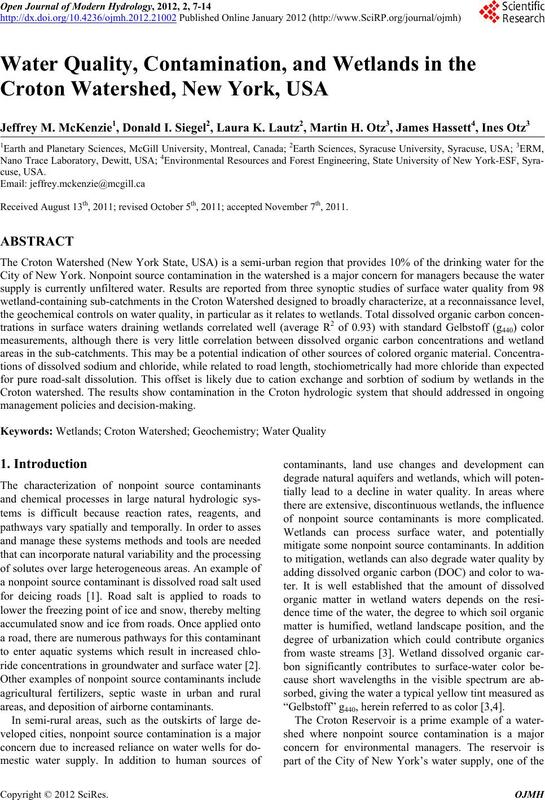 Received August 13th, 2011; revised October 5th, 2011; accepted November 7th, 2011.
ride concentrations in groundwater and surface water . areas, and deposition of airborne contaminants. 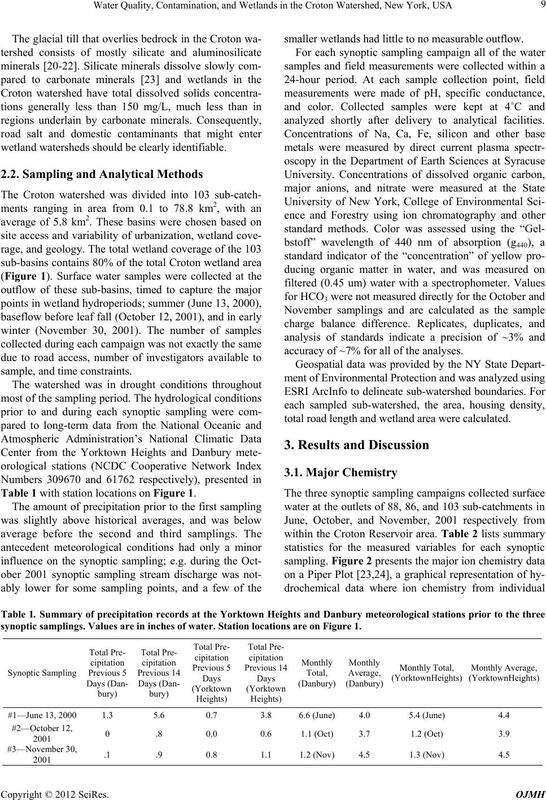 of nonpoint source contaminants is more complicated. “Gelbstoff” g440, herein referred to as color [3,4]. wetlands that cover 6% of the total watershed area . on how wetlands affect the fate and transport of road salt. tial data tied to landscape ch anges . Croton Aqueduct, or to maintain flow in the Croton River. ested uplands, urban development, lakes, and reservoirs. shaded by percent wetland area. wetland watersheds should be clearly identifiable. Table 1 with station location s on Figure 1.
smaller wetlands had little to no measurable outflow. analyzed shortly after delivery to analytical facilities. accuracy of ~7% for all of the analyses. total road length and wetland area were calculated. synoptic samplings. Values are in inches of water. Station locations are on Figure 1. Table 2. 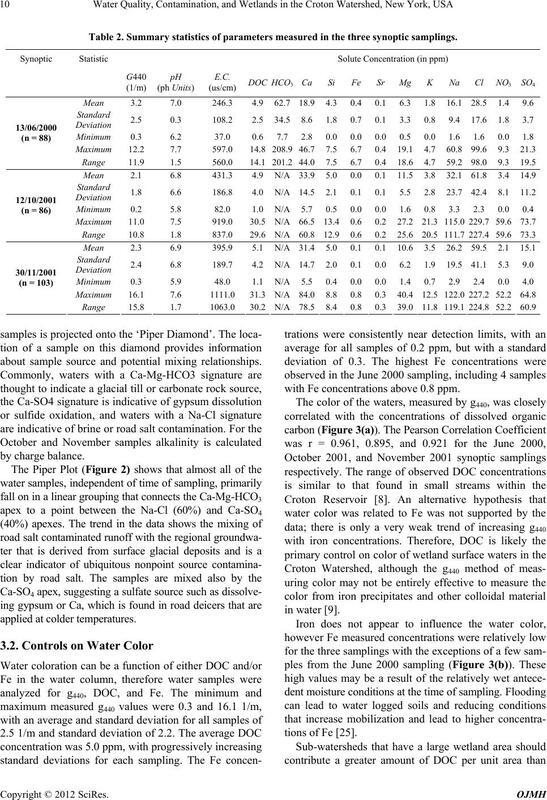 Summary statistics of parameters measured in the three synoptic samplings. about sample source and potential mixing relationships. with Fe concentrations above 0.8 ppm. Figure 2. 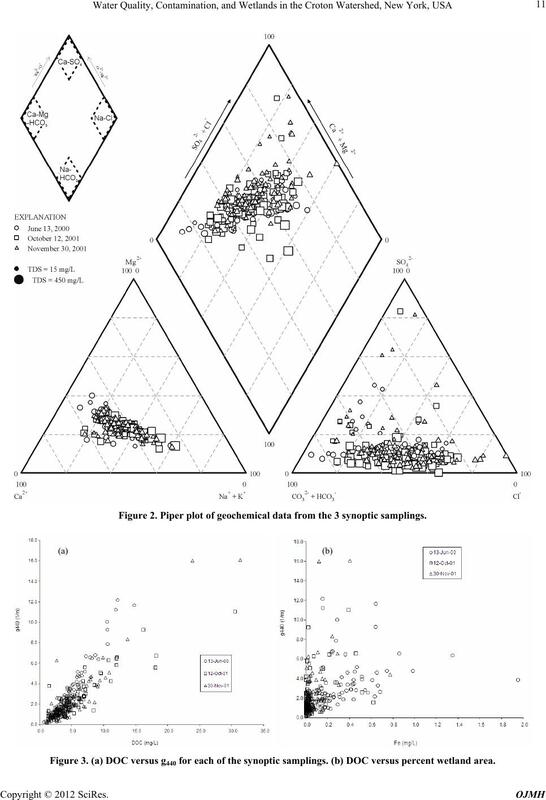 Piper plot of geochemical data from the 3 synoptic samplings. Figure 3. (a) DOC versus g440 for each of the synoptic samplings. 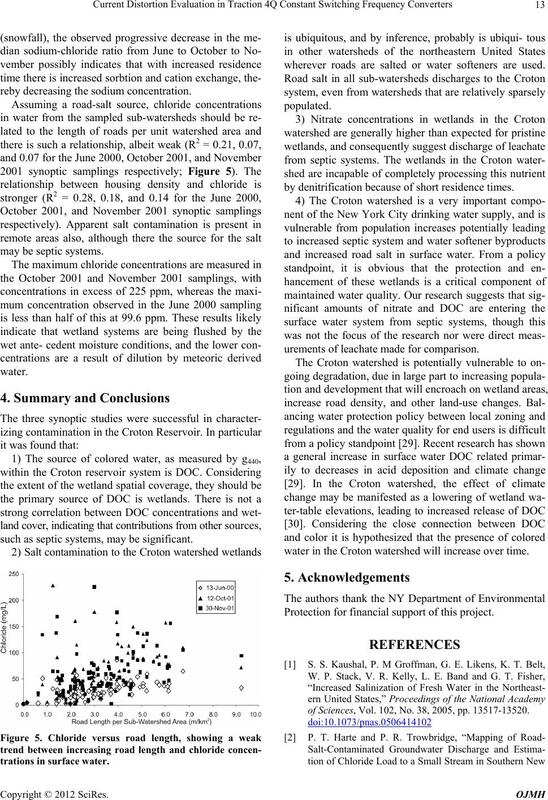 (b) DOC versus percent wetland area. ciency, which remains to be determined. discharge points from homes was not directly measured. wetland area per sub-watershed area, nor housing density. water reaches the sub-basin outlets [25,26]. samples clearly have a slope less than one. of the three synoptic samplings, showing a decrease in the relative concentration of sodium with time from the winter season. reby decreasing the sodium concentration. such as septic systems, may be significant. wherever roads are salted or water softeners are used. by denitrification becaus e of short residence times. urements of leachate made for comparison. water in the Croton watershed will increase over time. Protection for financial support of this project. of Sciences, Vol. 102, No. 38, 2005, pp. 13517-13520. 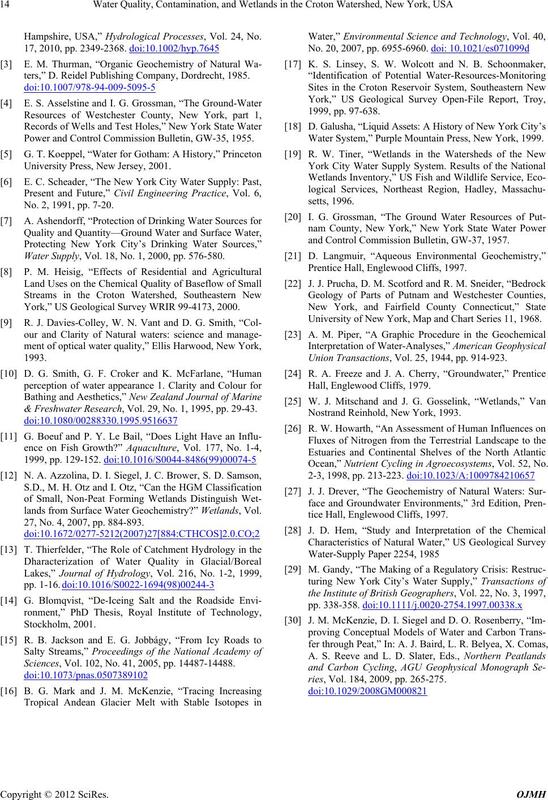 Hampshire, USA,” Hydrological Processes, Vol. 24, No. ters,” D. Reidel Publishing Company, Dordrecht, 1985. Power and Control Commission Bulletin, GW-35, 1955. University Press, New Jersey, 2001. No. 2, 1991, pp. 7-20. Water Supply, Vol. 18, No. 1, 2000, pp. 576-580. York,” US Geological Survey WRIR 99-4173, 2000. 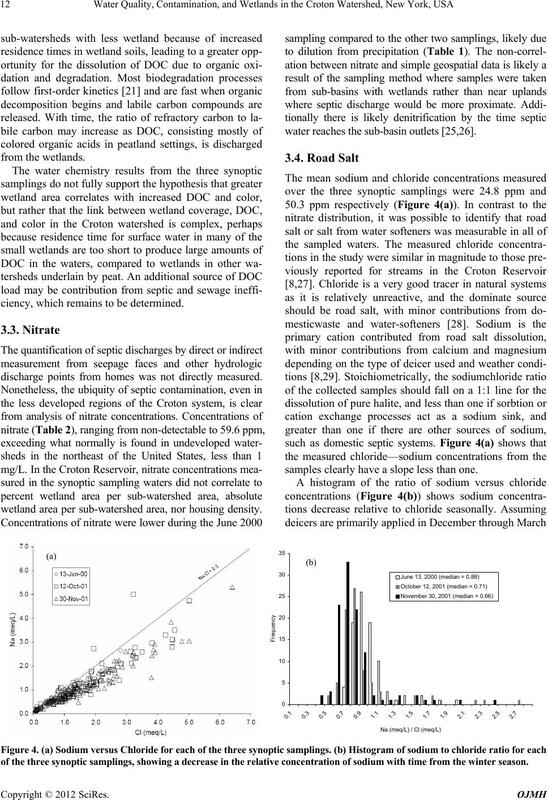 & Freshwater Research, Vol. 29, No. 1, 1995, pp. 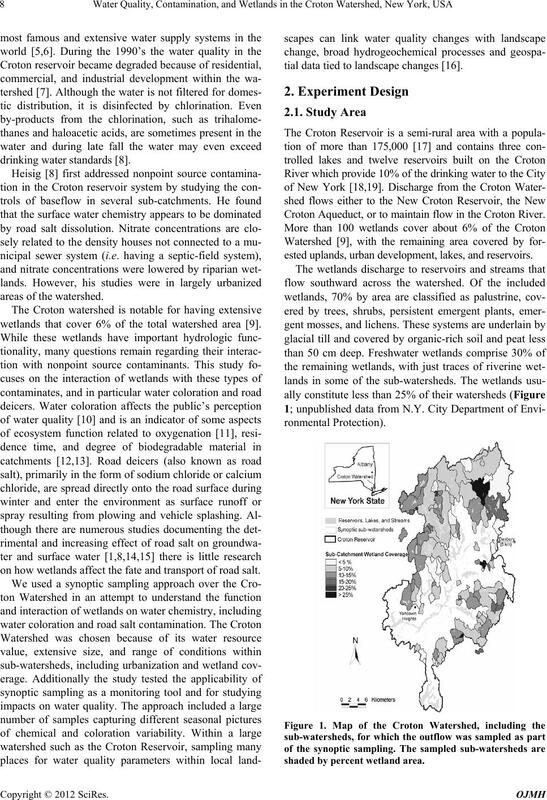 29-43.
lands from Surface Water Geochemistry?” Wetlands, Vol. 27, No. 4, 2007, pp. 884-893. Sciences, Vol. 102, No. 41, 2005, pp. 14487-14488. Water System,” Purple Mountain Press, New York, 1999.
and Control Commission Bulletin, GW-37, 1957. Prentice Hall, Englewood Cliffs, 1997. University of New York, Map and Chart Series 11, 1968. Union Transactions, Vol. 25, 1944, pp. 914-923. Nostrand Reinhold, New York, 1993. Ocean,” Nutrient Cycling in Agroecosystems, Vol. 52, No. tice Hall, Englewood Cliffs, 1997.
ries, Vol. 184, 2009, pp. 265-275.